To commemorate the British soldiers and other members of the military who died in the First World War, artists Tom Piper and Paul Cummins filled the moat of the Tower of London with ceramic poppies. 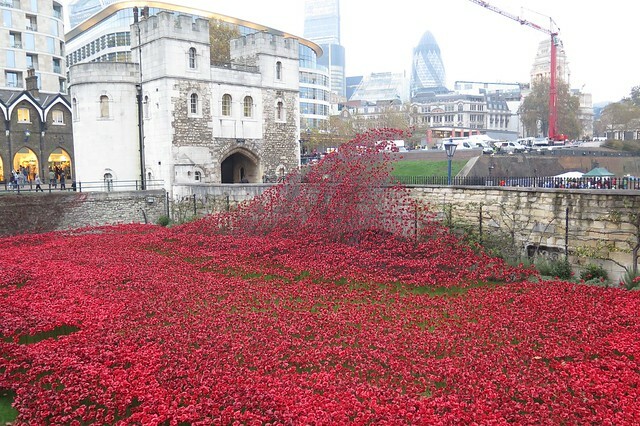 There were 888,246 poppies in all, one for every military fatality. I was in London recently. By the time I was there, the poppy exhibit was being dismantled (it was only ever meant to be a temporary exhibit). It was only a shadow of its former self but it was still gave a sense of the scale of loss inflicted on just one country by the war. Impressive as the artwork was, it might perhaps have communicated more of a sense of the grinding horror of the conflict if poppies had appeared roughly on the anniversary of the deaths they were meant to represent. That way the moat would gradually fill and only become a complete sea of blood red on the 100th anniversary of the war’s end. As is the short life of the exhibit disguises the duration of the horror of the First World War, though of course there would be logistical factors preventing that many ceramic poppies remaining in the open for four years. Near Łódź two German army corps manage to find themselves surrounded by the Russians. They break out of their encirclement, taking with them a large number of previously captured Russian prisoners. Mackensen continues his attacks on Łódź, but the fighting is becoming more attritional. There seems no likelihood that the Germans will be able to surround a Russian army. Instead the two sides are grinding away at each other, with victory going to whoever can keep going the longest. The Ottoman Empire has been in decline for centuries, but it is still vast, stretching from the Balkans to the Mesopotamia and south along the coast of Arabia. Mesopotamia borders Persia, and this bothers the British. Persia is not part of their empire but they have extensive interests in the country, especially in the increasingly important oil industry. Persia is also a bulwark against any land assault on British India. The British fear that Turkey may launch an invasion of Persia. To forestall this, they strike first. An amphibious force, mainly recruited in India, attacks the Mesopotamian port city of Basra. After a few days of fighting the Turks withdraw. Today Basra falls. Britain’s interests in Persia are now secure. The victory has been an easy one. Britain’s ambitions grow. Perhaps it might be possible for British forces to advance up the Tigris and Euphrates rivers to detach Mesopotamia from the Ottoman Empire. Potiorek’s Austro-Hungarian invasion of Serbia continues. Fighting is particularly intense in the vicinity of the Kolubara river. The Serbs are resisting as best they can but the invaders have the advantage, pushing back the outnumbered defenders. Belgrade looks increasingly like it will fall to the invaders. The Serbian army is also suffering from a desperate shortage of ammunition and is close to collapse. Austro-Hungarian forces are continuing their practice of harsh action against Serbian civilians. Bethmann Hollweg wants a decisive victory in the east – perhaps he will get one? The Germans under Mackensen are at the gates of Łódź, hoping to surround and destroy one of the Russian armies in Poland. But the Russians have reacted with uncharacteristic vigour. They call off their offensive into German Silesia and force march troops to the vicinity of Łódź. They smash into the flanks of the German forces. The tables have been turned: now it is the Germans who are in danger of encirclement. The weather is now afflicting each side as much as enemy action. Winter has arrived and at times the temperature drops as low as -12 Cº. With the failure at Ypres, Falkenhayn is no longer so confident of eventual German victory in this war. The German commander suggests that Germany should abandon aspirations towards total victory. Instead, a negotiated peace with Russia should immediately be pursued, allowing the nation’s forces to be concentrated against Britain and France. After all, why should the two conservative empires be fighting each other and not the liberal democracies in the west? 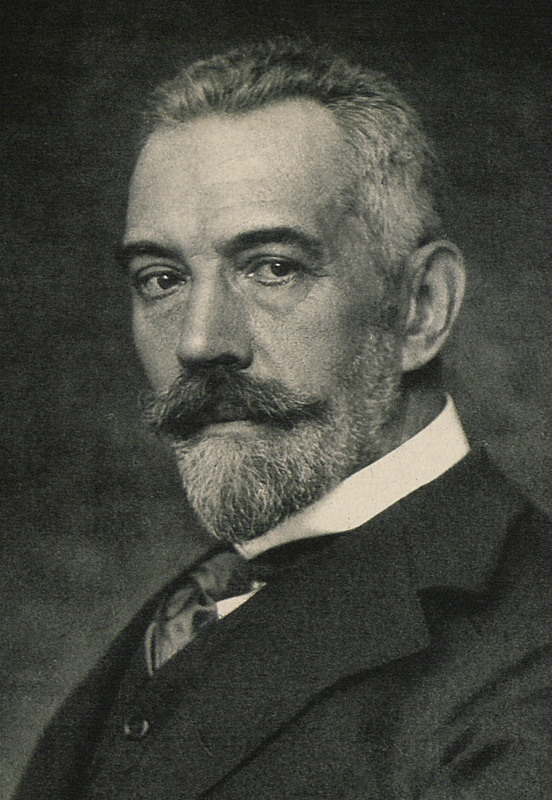 When Bethmann Hollweg receives Falkenhayn’s suggestion he is aghast. The Chancellor finds it unthinkable that Germany could open negotiations with Russia, as this would be an admission of weakness. If German forces were to win a decisive victory against the Russians then perhaps peace overtures could then be made, but for now there is no question that the war must go on. At Ypres the strain of the continuous fighting over the last month has left the British on the brink of collapse. But the weather has broken now and snow is falling on the battlefield. The Germans are wary of throwing more men at the British for no significant gain. The Germans call a halt to their offensives. Falkenhayn orders his men to dig into defensive positions, accepting that the war will not be won by the end of the year after all. Perhaps in the spring the attack will be renewed, but for now there is a halt to offensive operations on the Western Front. A line of trenches now stretches from the Belgian coast to the Swiss frontier. The fighting at Ypres was ruinous. The Germans have suffered some 80,000 casualties. The British have lost some 54,000 men, a far higher proportion of the soldiers committed to the battle. 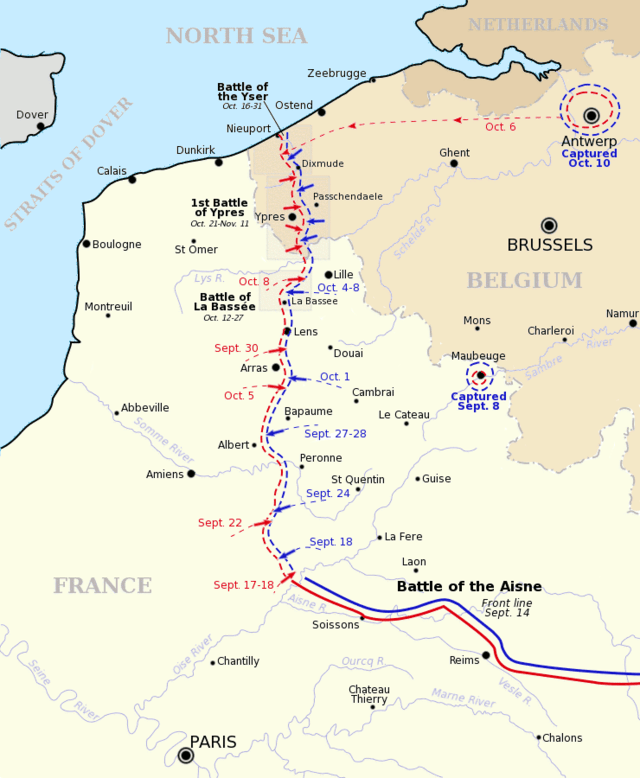 In the fighting since they arrived in France the British Expeditionary Force has been almost wiped out. Regiments of over a thousand men have been reduced to a few score survivors. Ypres has been a victory for British (and French) arms, but it has been a terrible one.